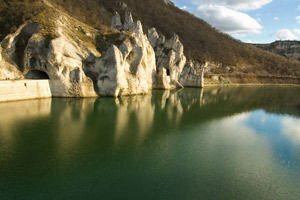 Rock Phenomenon Wonderful rocks is an extremely interesting and beautiful landmark in the region of Varna. Wonderful rocks is located 4 km from the village Asparuhovo, they are just on the picturesque coast of Tsonevo. From here the sea capital Varna is located about 90 km southeast. It is best to take the route through Provadia for quality roads. The phenomenon Wonderful rocks is only three kilometers from the turnoff to the village Asparuhovo, but you must not enter the village itself. Wonderful rocks was declared a natural monument on 05.08.1949. This beautiful area of the lake Tsonevo is located at a 12.5 ha total area among the incredibly beautiful natural area. An array of Wonderful rocks consists of about a dozen incredibly beautiful rock needles. Their height varies between 40-50 m, they all look very much like a fairy-tale towers medieval castle. The whole phenomenon involves three rocks in which they dug three tunnels and over which the road is paved with crushed stones. The natural Phenomenon Wonderful rocks is formed as a result of the influence of wind and water over limestone rocks. Those interesting in form limestones are not monolithic, and are divided into blocks, which rise immediately from the shores of Tsonevo. Exactly here Wonderful rocks are most steep and vertical. The phenomenon consists of three arrays along their entire length, ehere were dug three tunnels that channel the way for cars, made from crushed stone. As seen from the main road, the rocks often attract commuters who drop by to relax and enjoy the wonderful view and sculpted forms. In close proximity to the natural phenomenon "Wonderful rocks” is located a lodge, which is an extremely good place to stay if you decide to stay in the area. Lodge Wonderful rocks is located 3 kilometers from the village main road Asparuhovo, as close to it is another historic landmark - the historic ruins of monastery "St. Atanas". 17 km from here is lodge Kamchia. The lodge itself, Wonderful rocks is a massive three-storey building with 79 places, offering common toilets and bathrooms. The building has water and electricity, central heating, and thereto attached is a small restaurant and buffet. Path to the lodge is asphalt, there is parking. At present, lodge Wonderful rocks has the status of a hotel-restaurant by night and a double room costs about 25 euro. Beautiful phenomenon Wonderful rocks Is located opposite the hotel and tour on foot to them is about 1 hour. The most convenient route for arriving at Wonderful rocks is to take a left at the bridge, which leads to a natural landmark. After the bridge turn right and you are near the rocks. After the tour you can go back to the hotel across the bridge. Once you see Wonderful rocks, you can indulge in fishing in Tsonevo or sightseeing trips in the area. There are some interesting caves, rock formations and holes, some inhabited by large raptors. Nearby is Provadia where you can visit the historical fortress Ovech. Stroll to visit the only museum in the country for Mosaics, which works 10 to 16 hours. Be sure to visit the magic spring and Fossil Forest. Only 5 minutes walk from the natural phenomenon Wonderful rocks, is equipped with rock climbing routes. These challenges for fans of rock climbing are situated up a steep path, the site of an abandoned quarry of stones. The rocks have an interesting form of an arc, with a ceiling in its upper part. In September 1990, at this part of the area Wonderful rocks, is carried out a national championships in climbing. Especially for this race to the rocks is suitable route 8.